This page is only intended for MiiPC Model M1140. 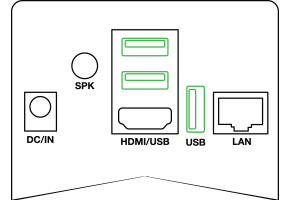 The update provided on this page is not compatible with any other MiiPC model. If you do not have a MiiPC Model M1140 please go back to the previous page and select the correct instruction link. 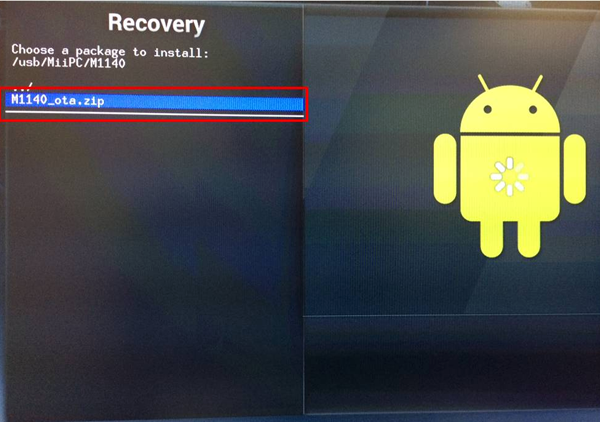 Download the corresponding MiiPC firmware software update image (M1140_ota.zip) file. 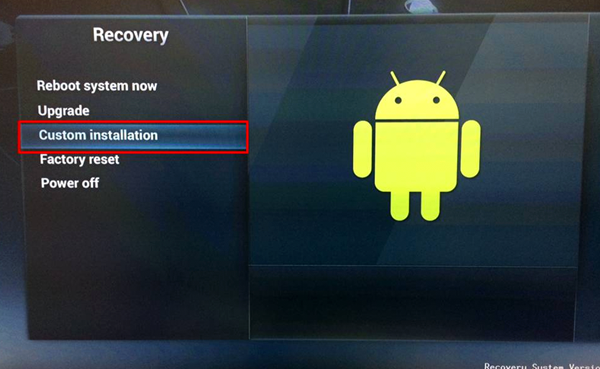 A link to the software update image for your MiiPC is provided at the end of these instructions. Copy the downloaded file to a USB thumb drive. 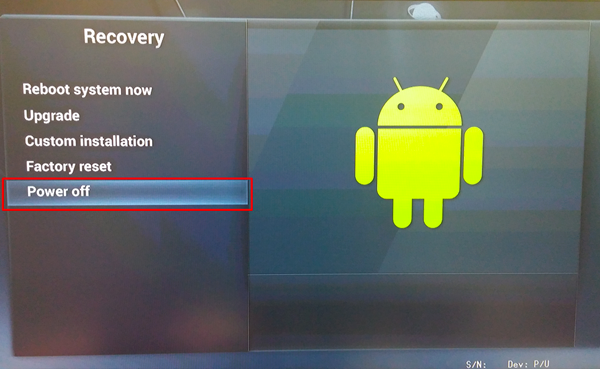 (Optional) If you had previously installed Google Play or wish to install Google Play on MiiPC, you will need to download a special Google Play file (google_play_mini_ota_m1140.zip). A link to this file for your M1140 MiiPC Model is provided at the end of these instructions. Copy the downloaded file to the same USB thumb drive. The USB thumb drive will be preselected. However, you may need to navigate into the folder containing the software update image (M1140_ota.zip) file that you downloaded in step #1. Use the keyboard up or down arrow keys to select the folder as you navigate to the software update image (M1140_ota.zip) file. Press the ‘Enter’ key on your keyboard to navigate into a folder. 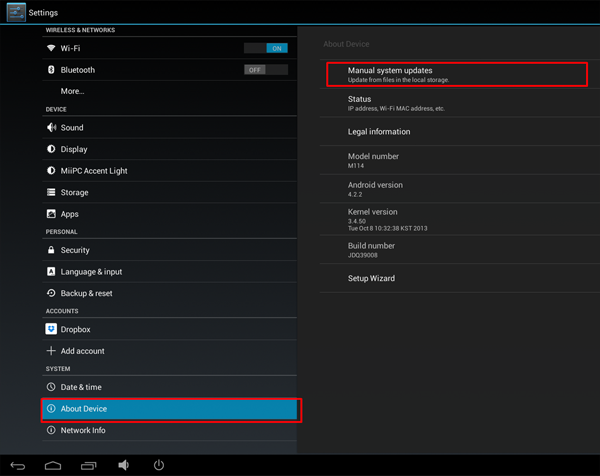 Use the keyboard arrow keys to select the software update image (M1140_ota.zip) file. Then press ‘Enter’ on your keyboard to begin the next step. Then navigate into the folder containing this special Google Play file (google_play_mini_ota_m1140.zip) that you downloaded in step #2. Then press ‘Enter’ on your keyboard to begin the installation. If you do not have a MiiPC Model M1140 then STOP NOW! 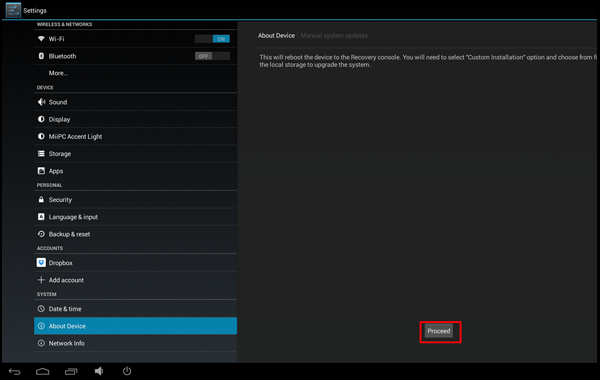 Go back to the previous page to select the correct installation instructions for your MiiPC model. 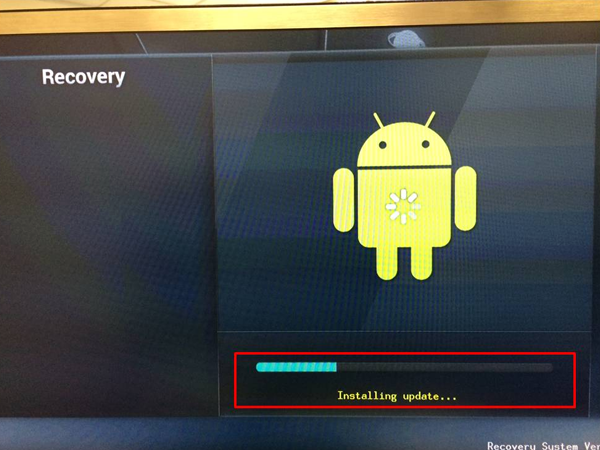 Click the button below to download the software update image (m1140_ota.zip) file for MiiPC Model M1140. 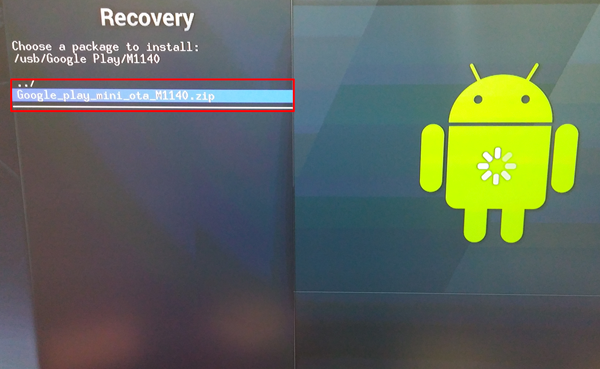 (Optional) If you wish to install Google Play, click the button below to download the special Google Play file (google_play_mini_ota_m1140.zip) for MiiPC Model M1140.